The routines feature interval training sessions where fast and slow rhythms and resistance training are combined to tone and sculpt your body while burning fat. Add some Latin flavor and International zest into the mix and you've got ZUMBA! Amy has been a member at MAC for eight years. Seven years ago after having a baby, Amy started taking Zumba classes and has never looked back. In February of 2015, Amy decided to become a certified Zumba instructor. Her philosophy is to exercise to be fit, not skinny, and works to become a better, healthier version of herself. 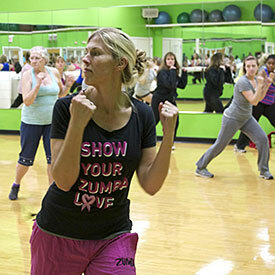 Zumba has become an addiction for Amy and she wants people to feel inspired when they partake in Zumba classes. She views classes as a workout and fun all wrapped up in one! Amy’s hobbies include traveling, singing, and spending time with family and friends. She is married and has four children. Julie is a certified Zumba instructor; teaching Zumba since 2008. 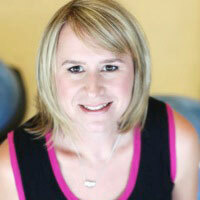 Julie is also an AFAA Certified Group Fitness and Water Aerobics instructor. She enjoys teaching a variety of classes including Zumba, Zumba toning, and Zumba gold. Julie loves the Zumba members at MAC for they have tons of energy and are so much fun to be around. They are always ready to exercise with smiles on their faces. Julie’s Zumba members inspire her to create new routines and to keep things fresh in class. Julie is married and has two daughters and a dog who all keep her busy and active when she is not teaching. Joyce joined MAC in 2006 and started attending Zumba classes in 2009. 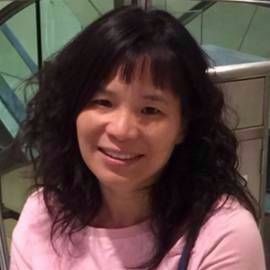 Joyce became a Certified Zumba Instructor in 2014, and is also a Certified FXP Hula Hoop Instructor. Before starting Zumba classes, Joyce felt like she had no strength and she suffered from allergies almost every day. Tired of taking medicine, she started cardio and treadmill workouts, but felt she needed more. When she tried a Zumba class she found it to be quite challenging, but felt she was not very coordinated at first. Today, Joyce has high energy, and no allergies! While obtaining her Master’s degree and working full time, she still tries to attend every Zumba class. Zumba has brought so much fun into her life, and she has made so many good friends in class. Zumba provides her opportunity to relax and release her stress from work. "I have been going to Julie's Zumba class with my mom, Lynn, for close to five years. I look forward to going to her class every week. Julie always has a smile on her face and keeps everyone in the class very motivated! Julie also is great about adding in new routines with the ones we already enjoy doing. Wednesday is one of my favorite days to come to MAC because of Julie's Zumba class!"